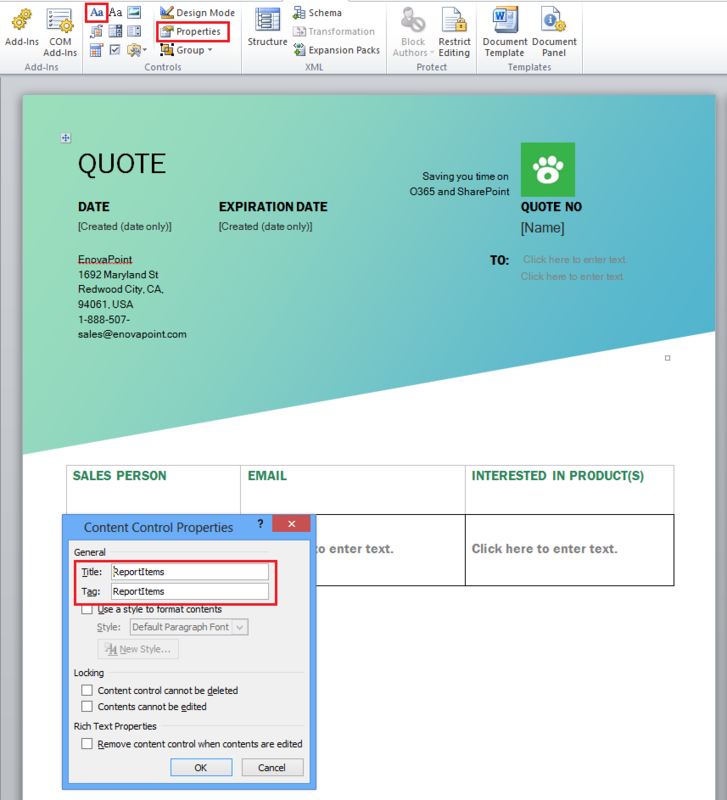 In this example case, you will learn how to create sales quotes with JungleDocs for Office 365. 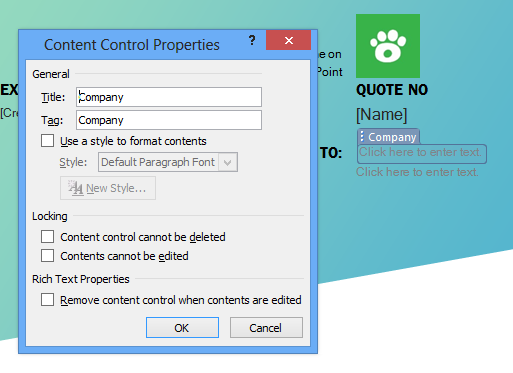 You will do this by automatically exporting SharePoint list item metadata into a Word document. Today we want to make it easier for people in our organization to create sales quotes for potential clients. When we achieve this task properly, our employees no longer have to copy and paste data from old to new documents. Instead, they will be able to simply select the company the quotation is for and the product the quotation is talking about. To be more specific, we want to be able to automatically export selected item metadata from the below list into a Word document. Once we have achieved this, it will make it easier for employees to quickly create documents, without mistakes. Let's get started . To start we will have to create a document library for our newly created sales quotes. We will add columns for the documents' metadata to this library. This will make it easier to keep the data throughout your documents and Office 365 environment uniform. Now that we have created a document library, containing the columns we want to use the metadata of, we can move on to the next step: creating the document template. 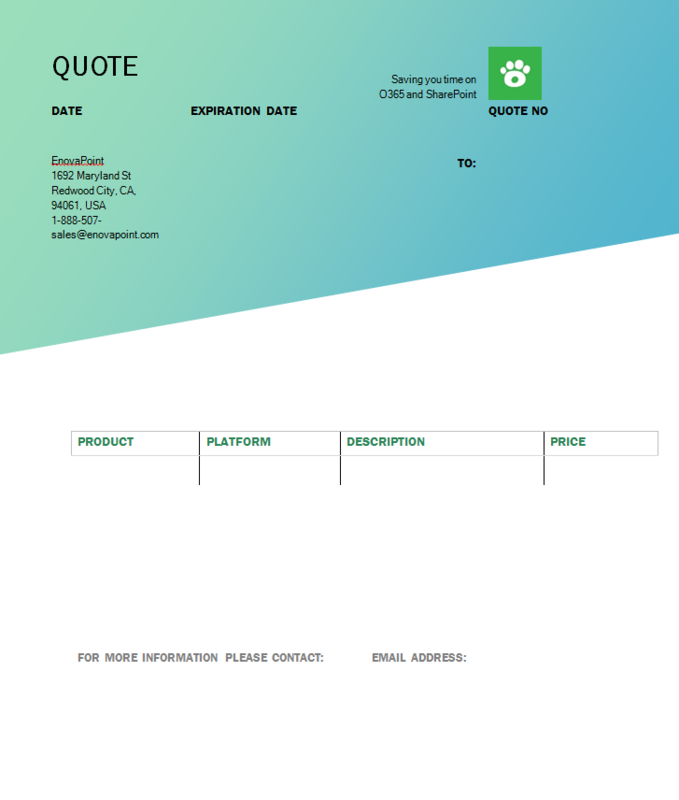 Now we will create a template for our new sales quote. First, we only insert static content. Static content is content that is always there and does not change. The image below shows us our sales quote with all of its static information. As we will later want to let JungleDocs populate the template with data from the Products SharePoint list, we will add a table for this with two rows. (In the image below this is the table with 'Product; Platform; Description; Price'). To follow each step yourself, you can download this document here . We will now insert content controls to let JungleDocs know what spaces should be filled with metadata from your Office 365 environment. 1. Select the table, and after you have done that open the Developer tab, and insert a Rich Text Content Control. 2. Once you have inserted the content control, click properties and enter the ReportItems formula in both the Title and Tag fields. 3. 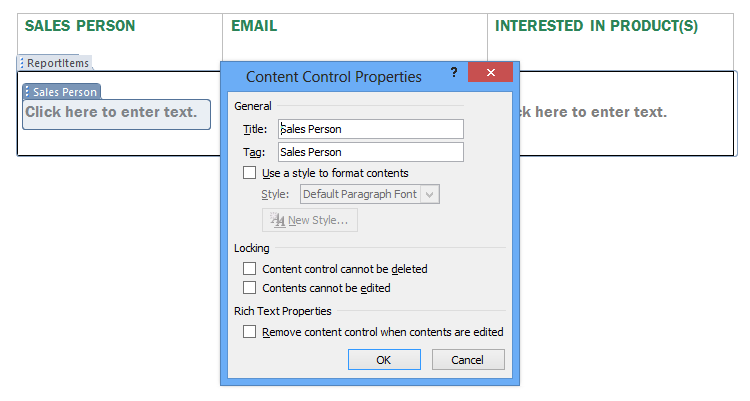 Now you will add new content controls in each column, directing to the SharePoint column you want to be targeted. So for Sales Person, this will be the Sales Person column in your SharePoint list. We will now add content controls that will function as placeholders for metadata that will be added at the last step of document creation. These are things such as the company and the quote number. 4. Again, add Rich Text Content controls and now write in the name of the columns in your Document Library (where the sales quote will be saved once it is created). You will then be able to fill this in during the last step when running the Report rule. 5. You can also insert more content controls with formulas for the date and quote number using formulas. 6. Once you have finished editing your template you can save it and move on to the next step . 1. Navigate to the Reports tab. 2. To add a Report rule, click New rule. 5. Once you have configured your new Report rule, click Save to save it. You are now done and can select the new rule from the Reports tab.